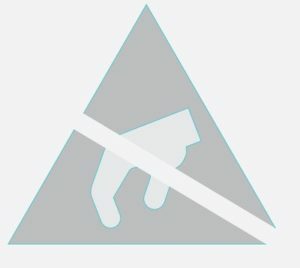 Every person who has purchased computer components or any bare electronics is familiar with the silvery sheen of the antistatic bag. 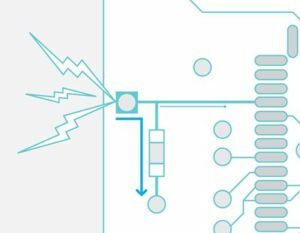 While it is common knowledge that electrostatic discharge (ESD) is bad for electronics, fewer are those who understand why. That nearly instantaneous transfer of electrons from one point to another, whether eliciting yelps of pain, or causing a temporary blanking of a TV monitor, or resulting in a cell phone that either restarts or decides to never start again, ESD is a part of everybody’s life. And it’s not very pleasant for people or electronics. While these discharges cannot be eliminated, there are steps that can be taken to protect any electronics that you design. Static electricity can come from a myriad of sources, but most people are familiar with the static electricity generated by their own bodies. When walking across the carpet, or shifting in a chair, a person’s body will physically pick up or lose electrons via the triboelectric effect. As the carpet and chair are not conductive, the electrons will not flow back to where they came from, but will build up. This will put the body at a different voltage potential from those objects around it. Static discharge is the equalization of charges on two entities that come together. If there is a greater electron density on one object than another, then when they touch, the electrons will try to equalize so there is the same density on both objects. If the two objects are conductive, the equalization process happens quickly. Technically, that equalization is an electrical current because electrons are flowing. Enough electrons moving quickly enough will produce a current that is noticeable and sometimes painful or destructive. For this reason, discharges are most frequent and noticeable when touching metal, as metal is very conductive and allows for a rapid transfer, in other words, a large current. A larger build-up in potential difference will also lead to larger currents. In dry weather, it is very common for there to be significantly more electric shocks than other times. This is due to the dryness increasing the resistance between objects, creating a greater insulated barrier. The ideal level of conductance is a balance between the two extremes. While there needs to be a low enough resistance to allow the electrons to flow and reach that equilibrium, it has to be a high enough resistance to make certain that this flow is too low to cause any damage. While certain ESD bags for components are only designed to resist the accumulation of static electricity, other ESD bags are dissipative in nature so they will constantly and slowly make sure that the bag is at the same voltage potential as its surroundings. On the other end, conductive ESD bags are also used. These will change voltage potentials more quickly but protect their contents by routing the current through the bag itself and not through any of its contents. While the main focus has thus far been about current due to direct contact, ESD can be induced by electromagnetic waves or pulses, an indirect source. If a device is going to be in an electromagnetically active area, then you need to avoid or protect inadvertent antenna traces. A strong enough electromagnetic pulse can create a voltage differential across a long trace that will induce a damaging current. It’s reasonable to ask at what level of discharge is damaging. This is a difficult question to answer because there are many factors which depends on the setup of the circuit. However, if there is an audible snap sound when there’s a discharge, then the voltage difference was at least approximately 5,000 volts. If you can feel it, it’s above approximately 2,000 volts. Unprotected integrated circuits can be destroyed at potentials less than 2,000 volts. It should be noted that the voltage potential is not itself what typically causes the problem but the current that melts or destroys portions of the circuit. That being said, there would be no current without the voltage, and this topic causes a fair amount of confusion. The damage that is caused by ESD varies depending on the circuit and where the discharge occurs on the circuit board or integrated circuit. The most common damage that occurs to practically all types of electronics is simply the damage caused by overcurrent. A very fast, yet high amount of current can melt silicon and literally blow traces off of circuit boards, basically creating shorts or opens where they should not be. In today’s prominently complementary metal-oxide-semiconductor (CMOS) based technology, silicon-controlled rectifier (SCR) latchups are a major concern. Due to the intrinsic design of CMOS circuits, without proper safeguards, a high voltage can activate a normally benign parasitic structure within the silicon substrate. This parasitic structure is, in essence, a thyristor between power and ground that will conduct high amounts of current through the substrate until all power is removed or the channel has burned itself open. This connection does not necessarily have to be between power and ground, however, those have the greatest potential of causing irreversible damage. There are several different models that are used in testing the susceptibility of electronics to ESD. These models are for simulating a discharge from a human body to a device, a conductive object to a device, and a charged device discharging to another object. The model for transference from a human body to a device is called the Human Body Model and is simulated by discharging a 100pF capacitor through a 1.5kOhm resistor to the device being tested. It is easiest to remember this model to think that the 1.5kOhm resistor is to simulate the resistance level of skin. For a conductive object, the model is called the Machine Model and instead of a 1.5kOhm resistor, a .5uH inductor is used and the capacitor is 200pF. As this lets a significantly greater current flow, the Machine Model is generally considered to be more stringent. The final model, in which a device is charged, most likely from the triboelectric effect while sliding through packaging on it’s way to be placed, is called the Charged Device Model. 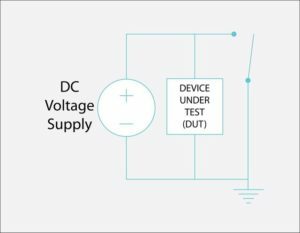 This test is performed by electrically isolating the device and then connecting it to a high voltage source, bringing the overall potential up. Once the device has been charged, it is mechanically touched by a grounded probe. Like the Machine Model, this is considered a more stringent test as it does not have a limiting resistor. Reducing issues with ESD should involve a two-fold approch. The environment in which a product is made, from manufacturer to distributor, should be designed specifically to reduce the build up of static. Also, products need to be able to survive the world of the consumer, so these products must be hardened against the static that they will confront once they are with the end user. There are certain tried and true methods that will help with either aspect but their application depends on the situation, budget, and standards. A two-dollar toy will not have seventy cents worth of ESD hardening added to the circuitry. However, a control board for a fighter plane that will be in an incredibly noisy environment while needing to maintain a zero percent failure rate requires that can a significant amount of time and money be invested to ensure the board has been appropriately hardened. To make a working environment ESD safe, there are a multitude of approaches. At the workbench, having a properly grounded mat and strap can make a significant difference. If this is not sufficient, there are commercially available ionizers that neutralize the charges on nonconductive objects. Take care in the implementation of ionizers, though, as they can actually compound the problem if setup incorrectly. There are also special ESD garments that can be worn by workers to also reduce the build up on their bodies as they move about the workspace or shift on their chairs and desks. Further methods to reduce static build up as workers move around the production floor is a specialized floor coating. Unsurprisingly, carpet is a non-ideal floor surface if dealing with electrostatically sensitive devices. To ESD harden individual devices is a bit more difficult as the methods have to be more carefully tailored to the device, its performance requirements, and its environments. Despite this, there are general tips that can be used, even if the implementation varies. Before pursuing these tips, however, first view the data sheets of the more sensitive integrated circuits to see if there are counsels specific to those devices. They may have recommendations that emphasize or contradict the general tips. The biggest step for the device itself is prevention, which is done through proper grounding. If the electronics are kept at the same voltage level as its environment, there won’t be the opportunity to develop a voltage differential. If the electronics are embedded in a larger system, then providing adequate grounding between the different aspects of the system will help significantly. For smaller, embedded devices that reside in user’s pockets, it is much more difficult to ground them properly as they’re floating and usually encased in nonconductive enclosures. These enclosures could technically be made of a dissipative or ESD-resistant material, but this will create trade-offs with the other aspects of the materials, such as durability. For those devices that do have a physical connection to power and ground, properly grounding the electronics and the chassis will cause any discharge to be routed directly to the power ground, not the electronics. With proper grounding in place, then methods for decoupling the circuit from potential surges is the next step. 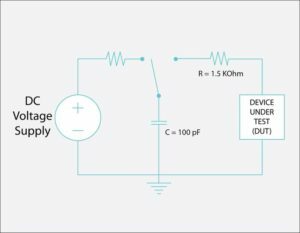 The simplest method, which is also rather effective, is to implement decoupling capacitors at places where a discharge is most expected. These capacitors are usually placed between power and ground near the integrated circuits, which serves the dual purpose of compensating for any dips in the voltage as the circuit pulls more current while also shunting any high-frequency noise directly to ground. These capacitors are also typically placed on any communication lines that leave the device itself and are accessible to the outside world. As people are plugging and unplugging their connections, such as USB or audio jacks, there can be discharges down those lines. The biggest problem with capacitors in this situation, though, is how they can affect high-speed communication signals. In the case of the USB, a capacitor on the signal lines could significantly slew the signal, rendering the USB useless. Any high-frequency line will be adversely affected by a capacitor, so other methods must be considered. Aside from capacitors, there are many other devices that can be used to protect electronics, varistors and transient-voltage-suppression (TVS) diodes being prominent on this list. Varistors, which conduct only at high-voltage levels, can be placed between any line of concern and ground. If there is a spike of high voltage that exceeds the clamping voltage, the varistor will switch on, shunting that surge directly to ground. TVS diodes are functionally similar to varistors in that they shunt any high-voltage surges while acting like an open at lower voltages. TVS diodes typically have a faster response time than varistors but in general are not capable of handling such high power spikes. Both of these, while effective, still have their own drawbacks. Despite not being designed as capacitors, these both have intrinsic capacitance and small, yet finite amounts of leakage current. While these are both designed to be minimal, it will require custom calculations to determine if they will cause adverse affects on your circuits. While they may provide a shunting effect, they’re also not immune to being destroyed in discharges, so they must be sized to accommodate the current that they’re expecting. Another method, besides shunting to ground, is to simply reduce the amount of electricity that can flow down a trace or lead. This is very simply done by putting a resistor in series of whichever line needs protection. This is a highly discouraged method for any lines that are anticipated to have non-negligible amounts of current. Otherwise the resistors will simply be turning power into heat, which is rarely a good idea. However, if the line is a simple communications line with no possibility of current flow, then it is a simple way to make sure that if a voltage is induced on the line, it will be absorbed more by the resistor than the circuit behind it. Electrostatic discharge and its effects are an interesting topic with many potential problems and an equal number of potential solutions. Knowing the advantages and disadvantages of each solution ensure sound engineering decisions that protect products from the wildly varying voltages found in the real world. While a one-size-fits-all solution would be ideal, that is rarely found in the engineering. Running basic calculations, implementing solutions, and thoroughly testing using different models will help in the never-ending goal of making products more robust. Interested in more advanced topics like this? Read our eBook: Advanced Topics for the Knowledge Hungry.